CarGurus has 2,930 nationwide 500 listings starting at $2,500. One year into its second-generation refresh, the stylish and diminutive Fiat 500 subcompact gets an upgraded sound system, new exterior colors, and an expanded trim lineup for 2016, with the addition of a new Easy trim. Fiat also adds a Cabrio version of its limited-edition 1957 Edition, which commemorates the 500's first year of production. It joins the 1957 Edition hardtop hatchback, which debuted in 2015. Available in both 2-door hardtop hatchback and 2-door 500c Cabrio drop-top body styles, the Fiat 500 brings distinctive Italian styling and small-car European flair to the country's roadways, and makes a definite design statement that separates it from competitors like the VW Beetle and the MINI Cooper. For a certain segment of automotive buyers, the 500 continues to offer something a little different--always part of its appeal. For 2016, the 500's trim lineup expands to include the new Easy trim, which slots in between the entry-level Pop and mid-level Sport. The Easy receives a number of standard features not found on the base Pop, including a 7-inch color screen, premium cloth seats, and a 276-watt Alpine audio system. 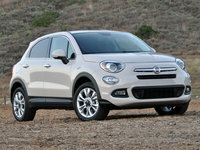 In addition, Fiat offers the Easy with a number of options not available on the Pop, including navigation, a 368-watt BeatsAudio sound system, and heated front seats. The Easy brings the number of available regular-edition 500 trims to six, with the upper-level Lounge, the more powerful Turbo, and the performance-oriented Abarth trims rounding out the lineup. The 500c Cabrio comes only in Pop, Easy, and Lounge trim levels. The new 1957 Edition Cabrio, available for a limited time, features a vintage-look interior with leather upholstery and a unique leather-wrapped steering wheel, as well as exclusive 16-inch retro-design wheels, retro exterior colors, and a sport-tuned suspension. All 500s continue to display a classic Italian exterior look that combines retro and modern design elements. The car's general A shape results in good visual proportions, aided in part by a short hood, a cabin that sits back on the chassis, and minimal overhangs. All hardtop trims get a rear spoiler except for the Lounge, which comes equipped with a fixed glass roof. Cabrio trims get a standard black soft top, and owners can upgrade to beige or red soft tops. Fiat offers the 2016 500 in a number of new exterior colors, including Spitfire Orange, Grigio Cenre (light gray), Rhino (dark gray), and Latte Menta (light green), as well as Celeste Blue, which was previously available only on the 1957 Edition. Buyers also can opt for a number of new wheel designs for 2016. A 1.4-liter MultiAir 4-cylinder engine provides base power for the 500. It develops 101 hp and 98 lb-ft of torque, and links to either a standard 5-speed manual transmission or an available 6-speed automatic with manual-shift and Sport modes. With the manual shifter, the engine posts fuel economy numbers of 31 mpg city/40 highway. Those numbers drop to 27/34 with the automatic. With only 101 hp, the base engine can feel underpowered at times, especially on the highway, but the two transmissions provide smooth shifting and a quality feel. As its name implies, the Turbo gets a turbocharged version of the 1.4-liter engine, which boosts hp to a more acceptable 135 and torque to 150 lb-ft. The turbo engine links to a track-tuned heavy duty 5-speed manual transmission and posts fuel economy numbers of 28/34. Fiat equips the Turbo trim with a sport-tuned suspension, sport-tuned exhaust, performance brakes, and red brake calipers. The Abarth gets the same turbocharged 1.4-liter 4-cylinder engine, with a number of additional upgrades such as an intake system with a high-flow air filter and a redesigned air box. It generates 160 hp and 170 lb-ft of torque, and mates to the same 5-speed manual transmission found in the Turbo. Fuel economy numbers remain the same as the Turbo's, at 28/34. The 500's 4-passenger cabin gets mixed reviews, with some critics liking its build quality and seat comfort and others commenting on its inexpensive cabin materials and tight interior fit, especially in the second row. Fiat improved the design of the 500's retro instrument cluster in 2015, making its gauges easier to read. The center stack and shift knob sit high, as do the front seats, which provide a good view out the front and plenty of room for the driver and passenger. Visibility out the back, however, remains limited at times. The rear seat can feel especially cramped for taller passengers. Cargo space behind the rear seats also remains tight, at 9.5 cubic feet, although it expands to 30.1 cubic feet when 50/50-split rear seat is folded down. The Pop trim comes with all the basics, and then some, including remote keyless entry, a leather-wrapped steering wheel with audio and cruise controls, and Fiat's latest-generation Uconnect 5.0 multimedia system, complete with a 5-inch touchscreen, 6-speaker AM/FM audio unit, Bluetooth, voice command, and a USB port. The Easy, Sport, and Lounge trims add the Alpine sound system and a 7-inch screen, while the Sport also includes sport cloth bucket seats and a sport steering wheel. The Lounge gets standard navigation and satellite radio. At the upper end of the power scale, the 500 Turbo receives sport cloth bucket seats with silver Argento accent stitching and Argento contrast stitching on the leather steering wheel and shift knob, although the Turbo lacks the upgraded sound system and navigation. The performance-oriented Abarth rounds out the lineup with such standard features as high-back performance-style cloth bucket seats, a flat-bottomed leather-wrapped steering wheel, aluminum pedal covers, and the premium audio system. All 500s come with 7 airbags (including a driver's side knee airbag) as standard safety equipment. Electronic stability control, traction control, and antilock brakes with brake assist are also standard. All 500c Cabrios include the automaker's ParkSense rear parking assistant as a standard feature. The Fiat 500 received a Good safety rating from the Insurance Institute of Highway Safety and an overall safety rating of 4 out of 5 stars from the National Highway Traffic Safety Administration. 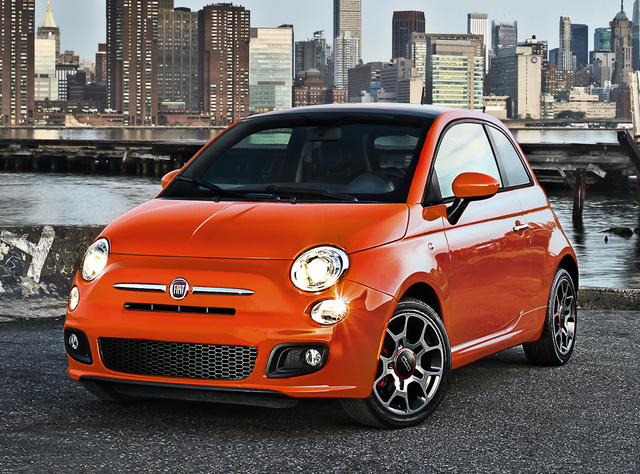 What's your take on the 2016 FIAT 500? Have you driven a 2016 FIAT 500?